Eobot (eobot.com) is a peculiar kind of operation, a cloud mining site, which does in fact meet 6 of the 7 cloud mining Ponzi criteria put together by the crypto community at bitcointalk.com, but which seems to be paying and which has indeed been around since 2013. The user feedback on the operation is similarly confusing: there are people out there claiming that Eobot is nothing more than a typical cloud mining scam, while others are adamant that the operation is paying them. Looking at the evidence provided on Eobot’s Audit page, it is indeed safe to assume that the site is paying its (or at least some of its) users. There are two Bitcoin wallets featured there, a Hot Wallet and a Cold one. The Hot Wallet is the one with all the outgoing transactions. According to blockchain.info, every day hundreds, possibly thousands of micro-payments are made from this address. The Cold wallet is apparently kept around as a safety measure: the site will pay its customers from it, if it ever gets hacked and user funds disappear as a result of that – or so the story goes. This is all fine and dandy, but does this really mean that Eobot is a legitimate cloud mining operation, and does it mean that it is profitable at all, even if it is? To address the first part of that question: while the payout-side of the operation is indeed relatively transparent (the micro withdrawals/payouts are apparently happening indeed) the same cannot be said about the revenue-generating part. There is no public mining address provided, so there’s no way for anyone to tell whether there is indeed real mining going on here. Anyone who joins the operation has to be prepared that it will take him/her at least 38 months to break even (to recover the principal). The site cautions participants that this calculus does not reflect any mining difficulty increases (which will inevitably happen) and that the whole activity should not be viewed as anything more than a fun experiment, which may indeed result in the loss of one’s principal. With the above in mind, it is really difficult to actually call Eobot a straight-up scam: it does after all, tell its users that they may end up losing their investments and that turning a profit is extremely unlikely. What Exactly Does Eobot Offer? The operation is involved in scores of other cryptocurrency initiatives, one weirder than the other. 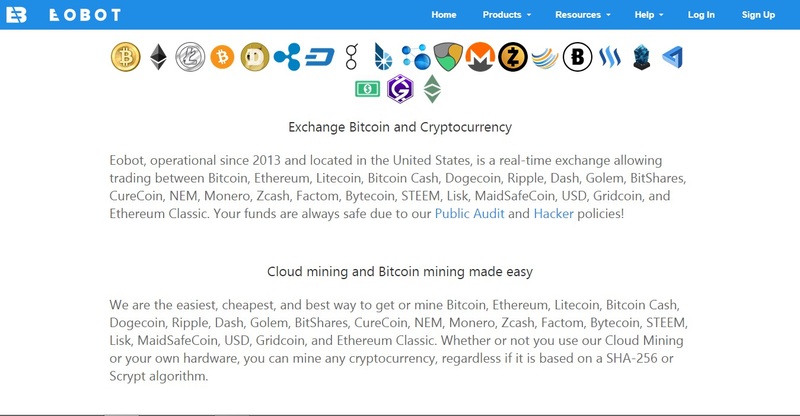 In addition to the cloud-mining scheme detailed above, they also have a faucet – yet another rather dubious scheme, which according to some may in fact infect users’ computers with a cryptocurrency miner. Indeed, as soon as we visited their faucet page, our CPU got spiked, so there is indeed something going on here, behind the scenes. As soon as we killed the browser window used for the faucet page visit, the cooling fan slowed down and CPU usage returned to normal. Eobot are so into this “users donating their unused computing power” angle, that they run some sort of SETI program called [email protected] on their cloud as well. To verify that there is indeed cloud-based SETI activity going on, users can check the [email protected] stat page. Those who sign up for such contracts, will be rewarded with Gridcoins. Eobot warn people not to expect to turn significant profits through this activity either. Cloud Folding is yet another quirky project peddled by Eobot. Through it, users can help medical research, and in return, they will be handed Curecoins. Profits can’t really be expected off this activity either, though it does in fact sound pretty interesting. The MyPool feature actually allows users to rent cloud mining from Eobot and mine into their own pools, including crytocurrencies otherwise unavailable through the site. Beyond its touted benefits, this feature can somewhat be viewed as proof regarding the existence of actual, physical mining at the site. Eobot also features an exchange section. That is really difficult to tell. One thing that we noticed though is that these guys do not promise anything really. In fact, they make sure to tell their users that they may end up losing their principals. That’s definitely a mark in the plus column for them. The site does not have an About Us page, and their support page only features a phone number (+1 (800) 485-4912) and an email address ([email protected]). It’s obvious that whoever is running this, isn’t keen on parading in the limelight. The web domain registration is private too. There is no actual proof of mining offered. There are some pictures of ASIC-based mining farms in their Gallery section, but it this day and age, that is simply insufficient as far as proof goes. They do allow their users to mine into their own pools though, which is a sign of legitimacy in this regard. Eobot run a referral program, which rewards their users with a 1% cut on their referrals. This element reeks a bit of a Ponzi construct. Eobot are apparently quick to admit that the services they offer might not be profitable at all. In that case, the question inevitably pops up: what’s the use? Why would anyone want to “invest” with them? At the end of the day, they lock up their users’ funds for 38 months. They may end up folding anytime, taking their users’ funds with them, and there’s nothing out there to prevent this from happening. Complaints about Eobot are plentiful at bitcointalk as well as in various Reddit threads dealing with the cloud miner. Payments have apparently been stopped to some users, while others continue getting paid. Something is certainly at least a little fishy in this regard. As of November 22, 2017, Eobot.com’s global SimilarWeb rank was 3,662, indicating it’s a highly popular website. More than the 20% of its visitors are from Russia, while other significant visitor demographic include Brazil, Ukraine, Vietnam and Thailand. Their high popularity might be partially explained through their employment of cryptocurrency ad networks, such as adbtc.top, which pay users to visit certain sites. Eobot might not simply take their clients’ funds and run, though there are no long-term guarantees in this regard either. Like any cloud mining scheme/faucet though, they are most likely simply not profitable, and they will be the first to admit it. With that in mind, you need to ask yourself: do you really want to pour money into this operation? Review Verdict: Eobot is NOT recommended! If you have been scammed by Eobot or if you believe we’re wrong in our review and that Eobot is a legitimate site, please let us know by commenting below. Learn about legitimate cryptocurrency investment opportunities by visiting our Bitcoin Investment Guide. EOBOT is a great site to mine. It could be expensive but its a safe place to invest some of your money. Its about ones carelessness that their accounts are hacked.Its not EOBOT to blame. i happen to be a customer in EOBOT so please you can join under my referal link if you wanna try out EOBOT. I have transferred for some 25€ worth of faucets to EOBOT, used cloud mining and lost money overall. I have been paid out in some 5500 doge that I withdrew back to my coinpot account, so they do payout, but the cloud mining scheme does not make any profit. They are simply too long contracts to ever get profitable. On January, 15th 2018 I tried to log in the site of Eobot and could not log in on mail to look at a code of verification and my account has been blocked, then check Id of the passport is offered, I loaded all images in the highest quality, today is already 18th of April 2018 that is three months my account is being blocked. By this time three times i wrote to support service, they answered that they are occupied with developing new program Id check. I advise to you have no deals with these scammers ! And what about withdrawals? Does it pay? i am using this site along with one called apextop.cc has anyone else any experience with apextop ? thus still in the plus .